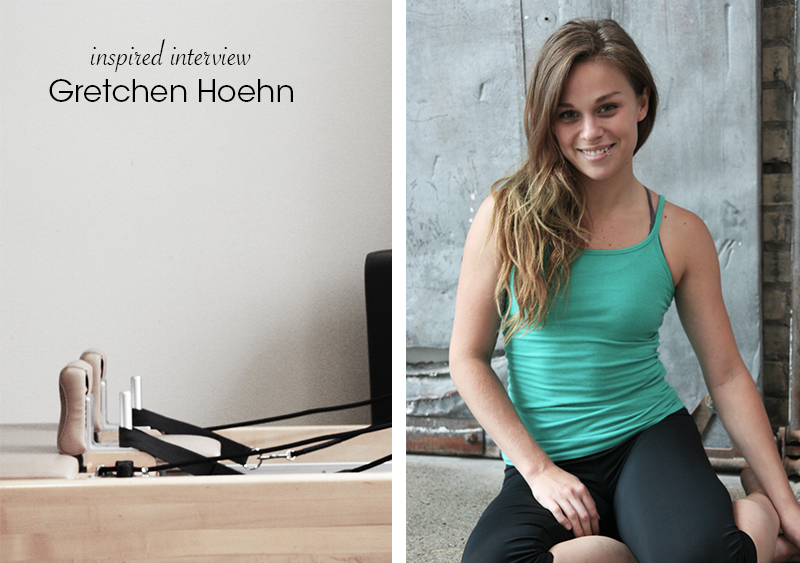 I have had the pleasure to get to know the lovely Gretchen from New Movement Pilates in Minneapolis. She has such a strong passion, natural talent with movement and the human body. We spent the morning together, she gave me my own little private lesson and run down on what the world of Pilates is like. I was challenged, supported, inspired and left feeling so much better than when I showed up for class. The movements that we did were similar to what I do in my yoga practice, but she still had me quivering and challenging my breath. After just a few exercises and movements I felt grounded, stronger and taller. How I held myself changed, it was an amazing feeling. Now, let me introduce you to this amazing woman, Gretchen Hoehn. How would you describe what you “do” as a Pilates instructor? Oh boy. Are you comfy? 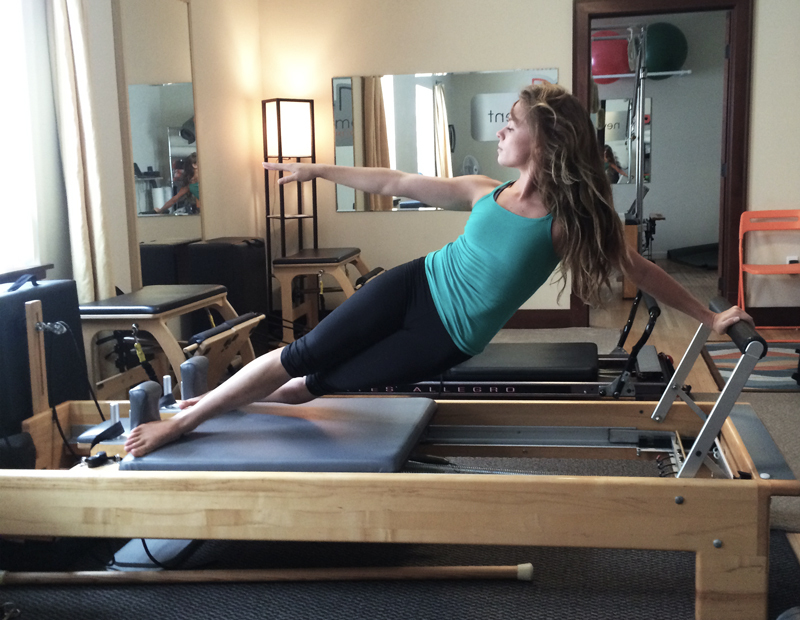 I may not be able to restrain my enthusiasm… I have so much to say about how Pilates can benefit every one’s body. Regardless of your age, your build, or your condition, Pilates is your friend. It is designed to catalyze improvement in any and all areas of the body while taking into account everyone’s unique quirks and needs. Instructors know plenty of modifications to accommodate people with osteoporosis, scoliosis, arthritis, and MS, among other physical ailments. Whether you’re a runner, carpenter, bus driver, Pilates will help you to do it more efficiently…really. Another key benefactor is Pilates’ connection to physical therapy as well as other therapeutic practices, such as chiropractic or massage. It not only pairs really well with them, but also serves as a preventative practice by encouraging the maintenance of ideal posture and alignment. It is also very popular amongst pre/post natal women, who want to retain or rebuild healthy abdominal strength. 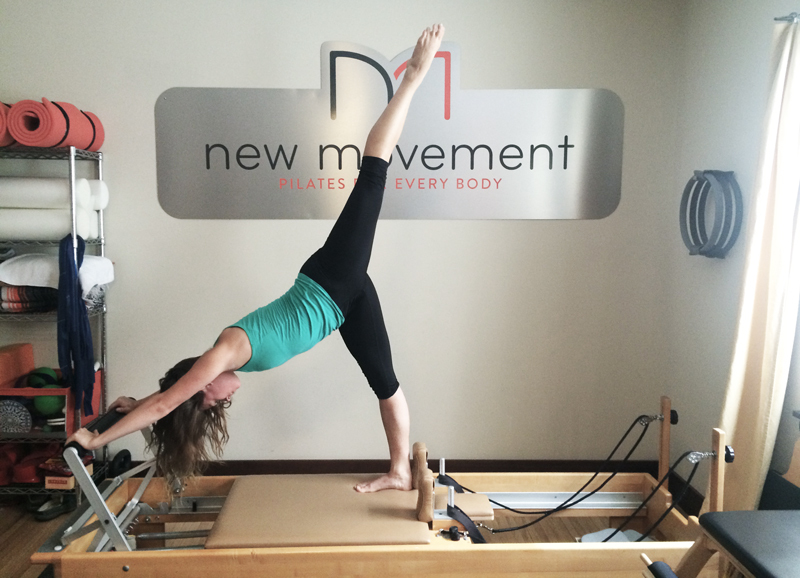 What is the difference between Mat Pilates & Reformer? The biggest difference between the two is that you’re using only your own body weight on the mat as opposed to additional weight and resistance on the reformer. It’s awesome, because you can do the same movement sequence on the mat as the reformer, but experience two very different work outs. Traditionally, new students would start on the mat and eventually start expanding onto other equipment, like the reformer. Although I still think that is solid way to start (because you only need to focus on you, rather than new equipment, too) mat exercises are certainly not any ‘easier.’ In fact, (and many forget this fact) Joseph Pilates designed the reformer with the goal that it would build the strength and stability required to improve the mat work! Nowadays, there are lots of beginning reformer classes, so newbies have the freedom to start wherever their heart desires! Why did you start practicing Pilates? I took Pilates only because it was required for my dance degree. And honestly, after the first couple classes, I could take it or leave it. I missed the more ‘zen’ atmosphere of my yoga classes and felt alienated by all of the anatomical jargon that I didn’t quite understand yet. The teacher was always saying things like ‘soften your ribs’ or ‘find your heel-sits bone connection’ And I’m thinking… But, aren’t my ribs hard? And you want my heels where? But soon, little things naturally started to click. My posture suddenly looked…different. My whole core looked more elongated and suddenly it felt like I was truly experiencing my body for the first time. I had made this incredible discovery about body that I hadn’t even recognized I was missing. That is why I continue to practice and I am inspired to teach… I really believe that if everyone were to make these discoveries within their own bodies, that everyone would be doing Pilates! I am asked this question ALL the time. There are many similarities, but also one pretty significant difference. They both share the intent of deepening the connection of the body to the mind, build lean muscles, and tend to leave you feeling tall, fresh and clear. Joseph Pilates incorporated yoga poses into some of his exercises, so there is some definite choreography overlap. Philosophically, however, they are quite different. Yoga is based around the idea of energy flow and has close ties to spirituality and meditation, whereas Pilates is primarily about conditioning. In other words, they have two very different approaches to the mind-body connection. This happens to make them extremely complimentary to one another. How would you describe your philosophy behind food and what you put in your body? What is your favorite quote or mantra you love right now? What is one item you always have on your market list? Yogurt! Always, always, yogurt. Probiotics, baby. Lunch? Tabbouleh salad: a simple vegetable and herb salad made with bulgar wheat- I swear this stuff is super-fuel! It gives me real energy and a little goes a long way. Dinner? Marinated chicken and fresh veggies on the grill has been a staple this summer. Commonly with a beer or glass of wine. Snacks? Kombucha tea is a much-loved part of my diet and is always a good pick-me-up if I need a snack. (so much that I brew my own) I also love fruit leather and luna bars. Hydrate? I try to drink one big glass of water before every meal and, as a general rule, have my water bottle with me. Where do your other passions fall? My passions are and have always been thoroughly scattered throughout the arts. Amongst many things, I am very passionate dance and most of all, painting. I’ve always had a massive desire to express myself and both of these art forms have had long-term resonance in helping me do that. This year, my focus has been less on dance and more on paint. In July, I finished a series of 5 murals at the Hudson Hospital Infusiton’s Center (in my home town). On my own, I’ve been making an experimental abstract series that is all about capturing an energy or mood… it’s kooky and messy and so much fun! Oh gosh. In all of the things, really. People and nature are especially big for me. (I know.. that really narrows it down) Some of the most basic, every day human behaviors are simply enchanting to me … we are such interesting creatures, each occupying completely different perceptions of the world. I am also fascinated by how things work: our bodies, the weather, concepts in chemistry and physics. It’s strange, I am both right-brained and completely infatuated with science. What makes you laugh, smile and happy? My family and friends, Regina (my cat), the right song at the right time, spontaneity, Disney movies, lilacs, Monty Python’s Ministry of Silly Walks, bickering elderly couples and to this day, some of the happiest moments in my life have been while I was dancing. What is your favorite part about being a Pilates teacher? Helping people! It is a real privilege to work with people of all different ages and backgrounds, each with their own unique set of goals, and to witness them reaching and commonly surpassing those goals. It happens all the time, and yet every time I see that look on someone’s face when something ‘clicks’ and they recognize their own progress, my day is made. That could never get old.. and that’s why I teach. How can locals find your classes or contact you for private lessons? When do you teach? For private sessions, you can contact me through the New Movement Pilates’ website or email at gretchenhoehn@gmail.com and we can set something up! Buy your first three solos and get the fourth free.